Marines who serve as advisers in Afghanistan are getting new training to help combat insider attacks, and it involves using their pistols to shoot body-shaped targets at point-blank range. This week’s issue of Marine Corps Times looked at the defensive marksmanship training that advisers tasked with mentoring Afghan troops are receiving as part of their pre-deployment workup. It’s a direct result of the concerns of the operating forces downrange, and it’s specifically for the Marines who spend months training Afghan troops — often relying on them for security as they serve in remote areas far away from other coalition forces. Recent reports show a promising lull in so-called green-on-blue incidents with November being the first month in 2012 with no attacks, a trend that continued into the first few weeks of December. And the best defense against insider attacks is good mentoring and relationship-building, training officials say. But still this year, more than 50 coalition forces were gunned down by Afghan troops — or insurgents posing as them. So the Marine Corps is preparing teams at the highest risk of an inside-the-wire attack to respond, and it means training in an office set-up on a range with no gear, armed with just their pistols. As combat in Afghanistan winds down, Marines will be called to different parts of the world as the Corps shifts back to its expeditionary roots. This could mean missions in places with anti-American factions or terrorist activity. And when countries are experiencing major transitions, like that in Afghanistan, it’s not always clear which side people are on. The threat of insider attacks could continue as Marines work with members of less experienced militaries that don’t screen and vet recruits as well as they should. This training prepares Marines for what they should do in that moment it becomes clear that they are under attack. This week’s issue also looks at new housing allowance rates, the Corps’ effort to clear up promotion backlogs for officers and a look at what they got wrong on the new Lt. Gen. Lewis Burwell “Chesty” Puller monument. 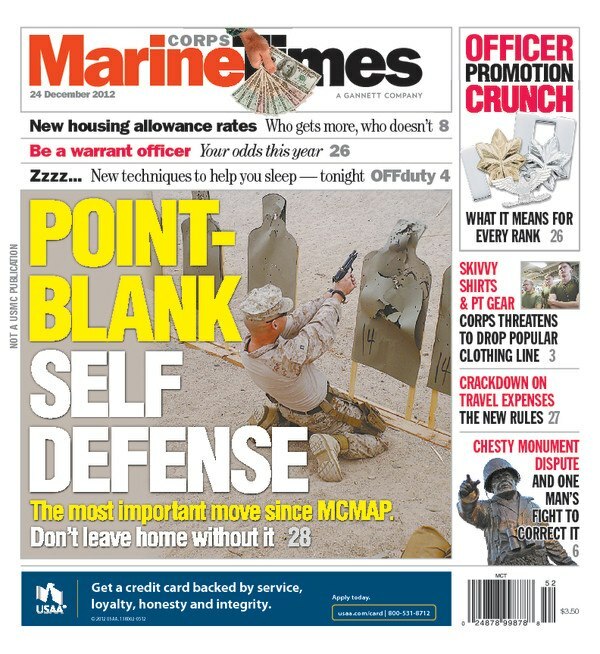 Read the full story on the defensive marksmanship training on Marine Corps Times PRIME here.